Courtesy of the New England Patriots/Eric J. Adler. FOXBOROUGH – Governor Baker today signed an executive order to assemble a task force of security experts who will analyze ways to augment safety and preparedness at large venues like sports stadiums, concert halls and convention centers. 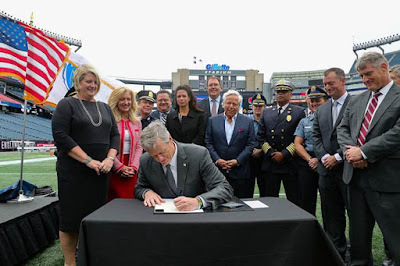 He was joined by Secretary of Public Safety and Security Daniel Bennett, Undersecretary of Homeland Security Patrick McMurray, Kraft Group Chairman & CEO Robert Kraft, TD Garden President Amy Latimer and several members of the task force at Gillette Stadium in Foxborough, MA. • Draft any recommended changes to statutes and regulations necessary to implement those best practices in Massachusetts. The governor will designate two co-chairs: the Secretary of the Executive Office of Public Safety and Security, and Mark Briggs, Managing Partner of Broadstone Group. Meetings of the task force will occur as frequently as necessary to accomplish the work.